Steve Aylett posted this video on Facebook recently. I’ve only watched part 1 of this program, but Robert Anton Wilson’s comment that Jack Parsons was both an engineer and an occultist corresponds with my unofficial “mission statement” of erasing the line between science and mysticism. The old bookseller was a type, and, as we think, a type only of Lytton’s own creation; perhaps a reflection of the soul of Lytton himself, ever groping through mists of tale and fable, and ever unsatisfied. His course of reading so far has been confined to the Strange Story, which first riveted his attention on fiends and spectres, and to Barrett’s Magus, which, being in English, and adorned with a number of weird plates, has proved an excellent stimulant to further exertions. The Bible is ransacked, and the Witch of Endor and Simon Magus duly weighed in the balance, while such phrases as “Now the magicians of Egypt they also did in like manner with their enchantments,” roll off the tongue with unctuous volubility. Presently the aspirant to “horrors fell and grim” stumbles across the treatises of Raphael and Sibly, and sighs to think that his ignorance effectually cuts him off from the delightful contemplations of those obscure authors upon whose diatribes their works are founded. 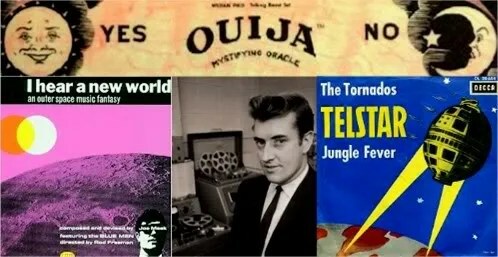 Joe Meek made some of the most spooky-sounding records of the 1960s, and they soundtracked a life that included murder, suicide, inventing Goth, communicating with cats, and holding black magic séances. He’s been called “the Ed Wood of lo-fi”.